To my ignorance I used to think all big CRT scopes were analogue oscilloscopes. 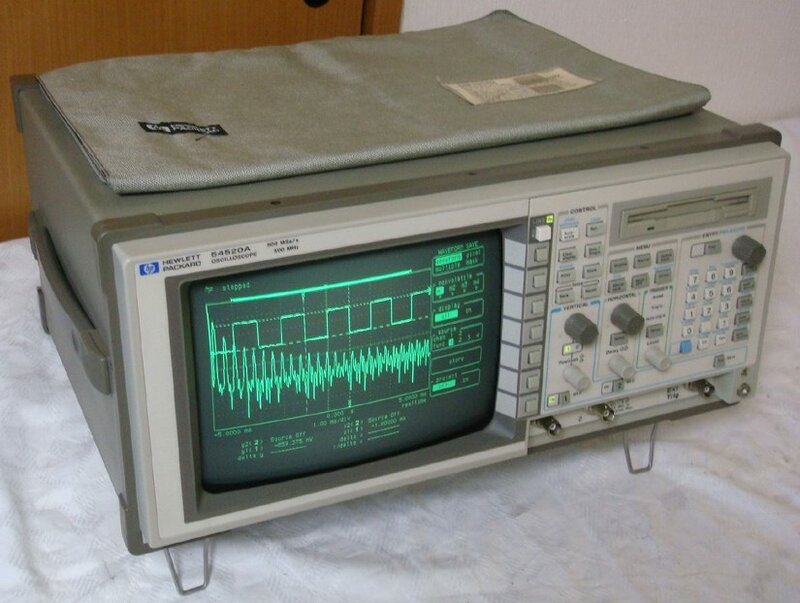 But I found out that there are digital storage oscilloscopes which were built by using CRT screens as well. How come text like a number can be displayed on a CRT? I can understand how a signal leaves traces on a phosphor screen through electron beam hits on the CRT screen by deflecting rays. But how is text displayed? Why isn't there any FFT function for such old scopes which are DSOs with CRT screens? How come a text like a number can be displayed on a CRT? I can understand how a signal leaves traces on a phosphor screen through electron beam hits on the CRT screen by deflecting rays. But how is a text displayed? You're saying "CRT" when I think you actually mean "vector display". Digital scopes had CRT's with bitmapped or raster displays were quite common from the first days of digital scopes until the price of LCDs dropped in the early 2000's. These displayed text the same way any other CRT computer monitor did. On a vector display, you can still display text. You just need a drawing routine that produces the text by routing the beam around the display and turning it on and off as required. You see this kind of text on things like radar displays going back probably to the 1950's or 1960's. Why is there no FFT on such old scopes which are DSO with CRT screen? An FFT takes a fair amount of processing power to perform quickly enough for the display to be responsive to user inputs. This was probably not possible with the microprocessors available at the price point the manufacturer and user wanted before maybe the mid-1990's. Not all scopes that can display digital information on their screens are DSOs. A Digital Storage Oscilloscope, by definition, digitizes an analog signal, stores those digitized samples, and then displays it. DSOs could be constructed with LCDs, CRTs, or any other display technology--there are even DSOs that don't have any display at all, and rely on being connected to a PC to display captured data. So if there's no digitizing, and no storage, it's not a DSO. It is this storage that provides the DSO the ability to perform arbitrary computations on the captured waveform, whether FFT, or integration, or whatever. But just displaying text on the CRT does not mean you have a DSO on your hands. The sort of thing you see in the picture in the OP is actually not uncommon in analog 'scopes, especially later models. Essentially the CRT can be driven by the analog front end, where the horizontal position is controlled by a ramp generator (the horizontal timebase) and the vertical position is controlled by the channel amplifier, or it can be controlled by perhaps a small microprocessor to draw vector shapes, as you would see in a vector monitor. Essentially, the scope alternates between drawing waveforms and drawing informational text or other information on the screen, presumably doing the vector drawings in between triggers. Some analog CRT scopes could even take digital measurements of voltage or time, with cursor position readouts and text menus that could be displayed and navigated through. However, it wasn't very long after that when DSOs became viable, and quickly took over the market. You can just paint the text by steering the beam. The X coordinate of the beam is not hardwired to a sawtooth, but also connected to a DAC, like the Y coordinate. The DACs read from sampling RAM, which contains ascending values for the X coordinate next to the sampled values, so the waveform is painted left-to-right. A microprocessor then writes a few extra positions at the end of the sampling RAM, which move the beam to the text area, and paint numbers. The first 1000 positions in memory represent the sampled waveform, as X,Y pairs. Then, we turn off the beam, go back to the left, turn the beam back on and paint a 5 to the bottom of the screen. FFT is a more complex operation that requires computing power, while simple sampling and reproduction of a waveform only require efficient streaming data paths to and from memory. Not the answer you're looking for? Browse other questions tagged oscilloscope or ask your own question. How is a modern digital oscilloscope calibrated? Why do (some?) 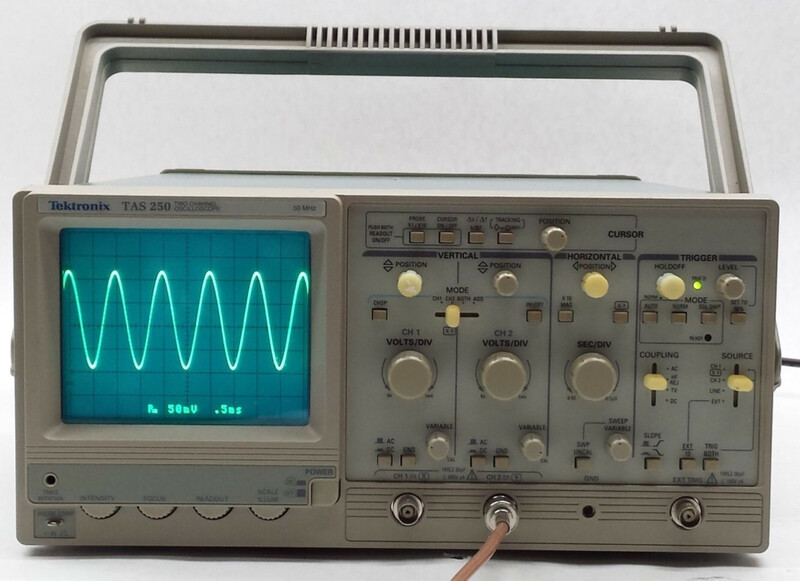 old CR oscilloscopes have blue/green plastic in front of the CRT?